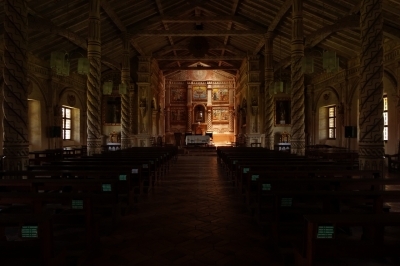 The Jesuit Missions of Chiquitos are a group of six churches that represent the living heritage of the reductions: ideal, theocratic settlements. 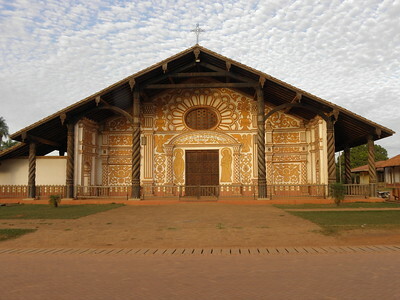 The churches have a unique architecture: they are large constructions, mostly made out of wood, with a double-sloping roof and a large porch roof. The Jesuit Fathers were sent by the Spanish Crown to the Americas to bring Christianity to the indigenous communities. In the Chiquitos region in eastern Bolivia they founded 10 missions in total, from 1696 (San Francisco Javier) to 1760. These missions or reductions were theocracies, the word of the Jesuit Fathers was transmitted through the local chief. Only the Chiquito language was authorized. The Jesuits were inspired by the “ideal cities” of the humanists. They developed an urban model consisting of a rectangular square, with the church, school and workshops on one side and the houses of the indigenous peoples on the three other sides. The eastern Bolivian landscape changes from ca. 30km before San Javier: the flat farmlands that surround Santa Cruz give way to light-green tropical plants and hills. This is Chiquitania, and they want you to know: signs along the road describe the history of the region and its Jesuit missions. For my visit to the missions, I stayed in the Gran Hotel Concepcion for 2 nights and visited Concepcion and San Javier from there. Concepcion is the more atmospheric of the two towns. It has a fabulous square plaza, just like the Jesuits designed it. I started my visit at the Mission Museum – a great start as it has stories and models of all missions. And lots of woodwork that has been taken from several churches. I especially liked the angels! Somewhere I had read that the churches only open for mass, but fortunately that’s untrue. In Concepcion you can enter the church from the adjacent church museum. And the interior even is more lovely than the colourful outside would suggest. It has both paintings and wooden sculptures in a naïve kind of style. Not something you would see in your average Spanish (colonial) catholic church. And then there is that bell tower, all made out of wood. The Jesuit Missions in Paraguay and Argentina had really smitten me on my previous visit to South America. When I had the chance to see their Bolivian counterparts, it was a must visit for me. Being based in Santa Cruz I decided to venture as a day trip to San Javier and try to get to Concepcion while making my way back to Santa Cruz by nightfall. My plan didn't quite work out as I was unable to find a ride to Concepcion from San Javier. The heat that day was unbearable and eventually I settled on returning to Santa Cruz. In comparison to the sites in Argentina and Paraguay I visited in 2016, San Javier is in way better shape. The church is still original as is the city planning including some original houses. Especially the wood art in the church was amazing (see picture). On the other hand the scope of the settlement seemed smaller than those found in Missiones. And the Indiana Jones feeling of the jungle covered ruins of San Loreto never materialized. Do as I did and go to San Javier. You can try to reach Concepcion in the same day. Head East to San Jose. For both options you can catch a bus at Terminal Bimodal. Please note that there may be multiple operators with different schedules. Seeing there is little information available online, it may pay off to check in advance when which bus runs when. The other thing to keep in mind is the siesta. Most churches seem to be closed from 12:00h to 14:00h. In my case I went by bus at 7:30h and took a 4h ride to San Javier. We arrived at 11:30h and I was able to visit the museum and church before the siesta at 12:00h. This entire area - formerly Chiquitos and now enlarged to include all of the Chiquitania - is a region with a unique culture, history, people, and environment. The product of a remarkable fusion of two civilizations, European and native American, its fascinating legacy remains intact to this day. Its world-famous Jesuit mission churches - six of which were designated World Heritage Sites by UNESCO in 1990 are only the best-known of many expressions of this rich synthesis of cultures. Others include its music (the famous Festival de Música Barroca y Renacentista Americana "Missiones de Chiquitos"), celebrated in world-famous festivals held every other year since 1996 throughout the region's major towns; an astounding heritage of sacred art and architecture; abandoned colonial ruins slumbering in pristine settings; and a wealth of centuries-old customs and folklore handed down from one generation to the next that still play a dominant role in the region's daily life. Visitors usually come to marvel at the unique ten Jesuit mission settlements, and especially their churches, seven of which survive in astonishing glory, lovingly restored in every detail - each a breathtakingly beautiful architectural wonder and spiritual monument set in the midst of an idyllic wilderness. Others come for the colonial ambiance, still evident in these towns' spacious plazas and slow pace of life. Some come for the colourful folklore and traditions maintained here and nowhere else. Still others come for the beautiful, hand-wrought art that has fascinated collectors and scholars for centuries. Yet there is more than cultural attractions. Nature rules here, and the inhabitants live in harmony with it. The options are limitless, from luxurious cabañas and the slow pace of life in the old mission towns of San Xavier and Concepción, to charming "lost-in-time" settlements like Santa Ana; from the lovely village of Santiago de Chiquitos to empty, eerie landscapes and petrified forests of the pathless Serranía Santiago and Serranía Sunsas; from prehistoric drawings in long-forgotten caves and rock faces to primeval forests larger than entire countries; from the northern edges of the trackless Gran Chaco to the watery wonderland of the Pantanal and the area's national parks with their unique ecosystems. As a Catholic Missionary in nearby Santa Cruz de la Sierra for the last 18 years, I have been to the Jesuit Missions serveral times, especially San Javier and Concepción which are now only 3-4 hours drive on paved roads. The restored Church's and other structures, the abundant wood carving, the music and musicians, the local cultures and tropical scenery, all surprise for their beauty and for the history they represent. They are certainly well worth the trouble to visit.